Gifts are among oldest and most pleasant parts of wedding ceremonies all over the world. Although a gift is not a must, it is hard to imagine a guest coming to the wedding without at least a symbolic present. Things get even more complicated if bride-to-be and groom-to-be decide for wedding registry, if they have a lot of guests who don't live near the place of wedding reception, if one of them is not getting married for the first time, if they are already living together, ... Another question and creativity challenge is to find out how we can incorporate a chosen present into the used theme (if any). 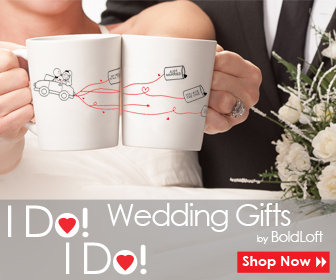 It is, for instance, inappropriate to even mention wedding gifts in your invites, but you can direct your guests to your wedding registry at your web pages. On the other hand you can give detailed instructions about presents in invitations for bridal showers. Of course we all want to do it right. We all want to give (and get) gifts which are unique, useful and personalized. Nobody want to spend time, energy and money for an item which will only collect dust on shelves. It is our goal to present general rules, explain the reasons behind them and offer as many unique ideas as possible to make everything related to wedding gifts as easy and enjoyable as possible. In this pages you'll find numerous tips for specific situations for brides, grooms, bridesmaids, maids of honor, mothers-in-law, guests, flower girls, ring bearers... The list goes on and on! New articles will be added on constant basis, as will new ideas and products, so feel free to bookmark this page for your convenience.